Whenever using email marketing, allow customers an opportunity to opt-out of receiving mass emails. 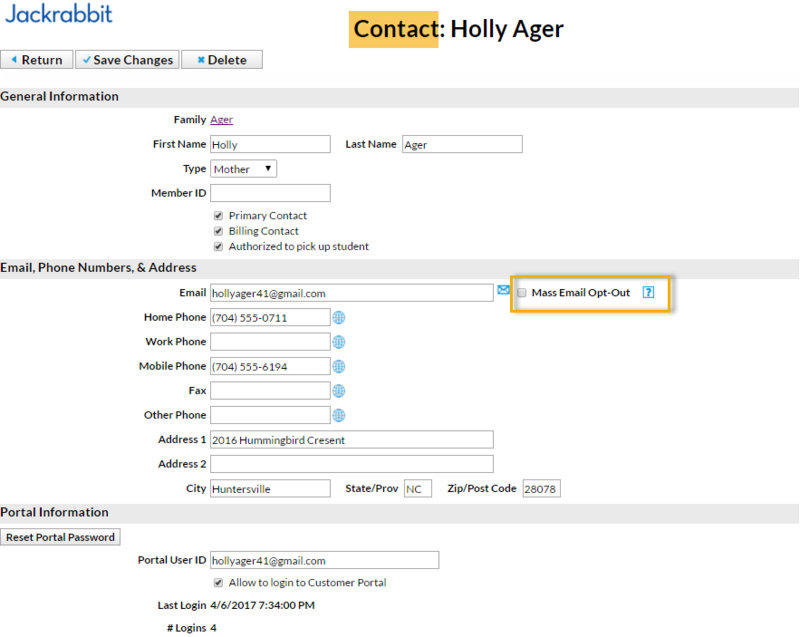 Each contact and student has a Mass Email Opt-Out checkbox to indicate their preference for receiving mass emails from your Jackrabbit database. The contact Mass Email Opt-Out check box is located on every Contact record. 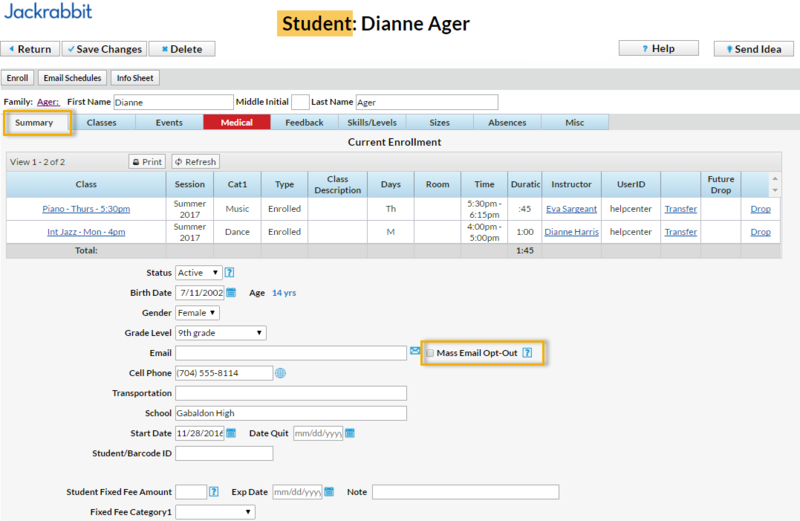 The student Mass Email Opt-Out checkbox is located in each Student record on the Summary tab. Emails sent to contacts and students from the Families menu > Email/Text Families in Jackrabbit contain opt-out text and an unsubscribe link at the bottom of the email. The opt-out text and unsubscribe link are also included in the emails sent from the Families menu > Lead File > Email Leads and in emails sent from an individual family record. They are offered the option of opting out (unsubscribing). If they select Please remove me from the mailing list and click Submit, the recipient will see a page confirming their opt-out of mass mails. You'll receive an email (to the email listed in Tools > Edit Settings > Organization Defaults > Organization Email) telling you the email address has chosen to opt-out of future mass emails. 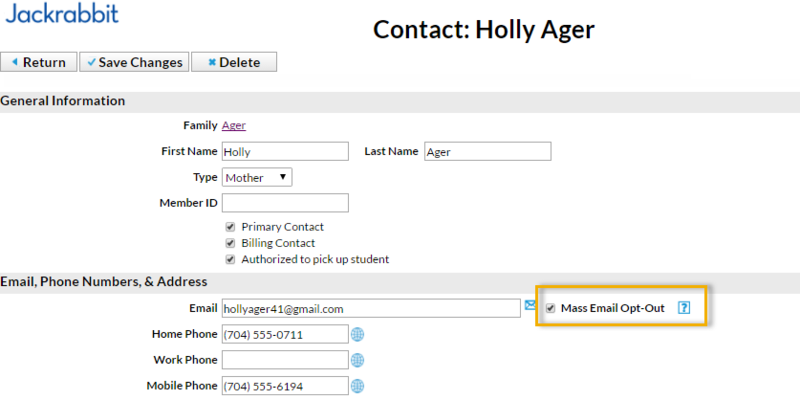 The contact (or student) page associated with the email address is automatically updated and the Mass Email Opt-Out checkbox is selected. For important information such as a school closure it is possible to 'over-ride' the opt-out choice when sending via Families > Email Families. Set Include Opt Out Emails = Yes.